Mr. Jean Todt was born on 25th February 1946 at Pierrefort, Cantal (France). He has one son, Nicolas, aged 36, and shares his life with Michelle Yeoh. 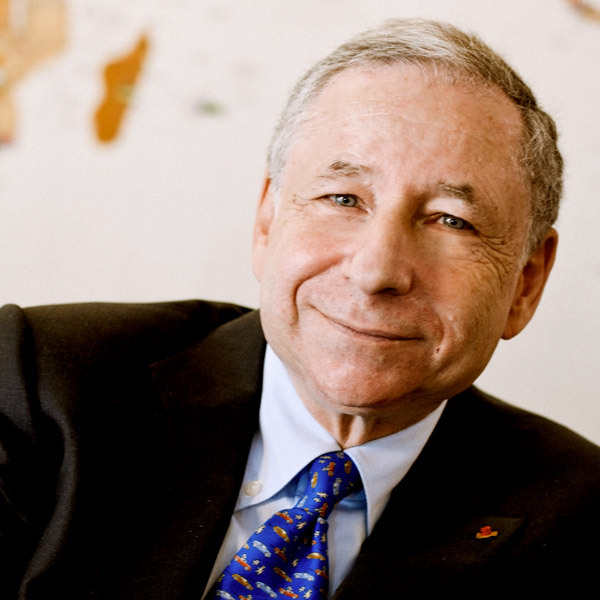 After High School, Jean Todt studied at the “Ecole Des Cadres” School of Economics and Business in Paris. In 1966, he started his career as a rally co-driver and participated to the World Championship rallies with most of the car manufacturers together with international rally drivers until 1981 when, with Guy Frequelin, they won the Constructors’ World Rally Championship with Talbot Lotus. He also represented the drivers in the FISA (Fédération Internationale du Sport Automobile) Rally Commission from 1975 to 1981. At the end of 1981 he became Peugeot Sporting Director and funded Peugeot Talbot Sport which under his management won two Constructors’ World Rally Championships, two Drivers’ World Rally Championships and obtained several wins in rally raids, including four in a row in the Paris-Dakar. He also represented the Constructors in the FISA Rally Commission. In 1990 Jean Todt was appointed Motorsport Director of the PSA Peugeot Citroen Group. In 1992, Peugeot won the World Sports Car Championship and obtained two consecutive victories in the Le Mans 24 Hours in 1992 and 1993. In the middle of 1993, Jean Todt left Peugeot and became Team Principal of Ferrari Racing Division (Gestione Sportiva). Under his leadership, Scuderia Ferrari has won 14 Formula 1 World titles and 106 Grand Prix. In 2001, Jean Todt took on responsibility for all motor sport activity for the Ferrari-Maserati Group and became Member of the Board of Directors of Ferrari. In the middle of 2004 he was appointed General Manager of Ferrari and, at the end of 2006, he became Chief Executive Officer of the Company, maintaining the responsibility of the Gestione Sportiva. In March 2008, he decided to leave his positions of CEO and Director of Gestione Sportiva while maintaining that of Member of the Board, Advisor to the Chairman and also maintaining that of President of Ferrari West Europe (Paris) and Ferrari Asia Pacific (Shanghaï). In March 2009, he ceased any occupation in Ferrari. On 23 October 2009, Jean Todt is elected President of the FIA (Fédération Internationale de l’Automobile). He is elected for a new four-year term on 6 December 2013. He is also President of eSafety Aware and Member of the Board of Trustees of FIA Foundation for the Automobile and Society. He is an Honorary Member of the Automobile Club de France and Honorary President of Federazione Auto Motoristica Sammarinese (FAMS) of San Marino. Moreover, he is a Member of the Board of Directors of Edmond de Rothschild SA, and of the French companies Gaumont and Groupe Lucien Barrière. He is also a Member of the Board of Directors of the Société des Amis du Musée d’Art Moderne de la Ville de Paris and a Member of Sotheby’s International Advisory Board. On 14 July 2011 Jean Todt was elevated to the dignity of Grand’Croix of the Légion d’Honneur of the French Republic. Commendatore della Repubblica Italiana in 2002, he was given in 2006 the title Dato Seri, named in 2011 Member of the Ukrainian Order of Prince Yaroslav the Wise. He was promoted in 2012 Grand Officier of the Republic of San Marino Order of Sainte Agathe, and received in 2013 the distinction of Commander of the National Order of Merit of Senegal and in 2014 the first class order medal from the King of Bahrain. Jean Todt holds an Honorary Degree in Engineering from the University of Florence and is a Member of the French Académie des Technologies. Jean Todt also devotes himself to humanitarian and other causes: in 2003, he was made a roving Ambassador for the Republic of San Marino and in 2009 he was named Tourism Ambassador for Malaysia. He is one of the Founders and the Vice-President of ICM (Institut du Cerveau et de la Moelle Epinière), an Institute devoted to medical research for brain and spinal cord disorders with seat in Paris. In March 2014 he became a member of the Board of Directors of the Suu Foundation, a humanitarian organization dedicated to advancing the health and education of the people of Myanmar (Burma) founded by Nobel Peace laureate Aung San Suu Kyi.